Currently, California employers are able to deny employment to employees who refuse to agree to submit employment-related claims to private arbitration, rather than preserving their ability to file a lawsuit in court. The law would not ban such agreements to arbitrate entirely, but rather would require that employers explain that agreeing to arbitrate is entirely voluntary. Employers will be barred from threatening, discriminating or retaliating against employees who decline to waive their rights, and employers will be forced to prove that an employee knowingly and willingly signed the agreement to arbitrate, should the employer attempt to enforce it. Obtaining knowing consent to the agreement is currently an issue in industries that employ large numbers of people who speak minimal to no English, as there is no legal obligation for employers to provide agreements to arbitrate in other languages. This law would not apply to employees who are required to register with a self-regulatory organization, such as securities traders, or to employees who were represented by an attorney when they signed the contract. It is also very important to be aware that AB465 only makes it illegal for employers to require arbitration of Labor Code claims. Claims of discrimination and harassment, which are part of the Government Code, are not covered under the bill. So employers would still be able to require arbitration of discrimination and harassment claims as a condition of employment. The Governor has until October 11 to act on the bill; after that date, the bill will automatically become law if the Governor takes no action. Governor Brown is receiving pressure to veto the bill from the California Chamber of Commerce, as well as other trade groups representing employers in such industries as construction, hospitality and retail. It is important to note that the bill would not make it illegal for employees to waive their rights to sue or bring claims before the Labor Commissioner. 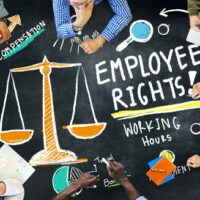 Rather, employers would instead be required to ensure that the waiver in question clearly stated that it did not need to be signed as a condition of employment, and that it was agreed to voluntarily. If the bill becomes law, it would affect agreements entered into on or after January 1, 2016. If you are facing an employment related legal issue, contact Bay Area employment litigation attorney Richard Koss for a consultation on your claims, at 650-722-7046. Update: AB 465 was vetoed by the Governor on October 11th.